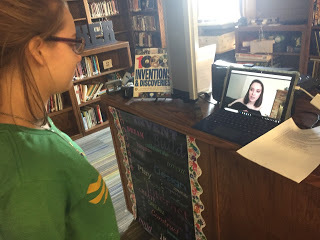 Over the past few years, some of the most exciting activities we have held in the library have been Skype connections. From Mystery Skype to virtual tours of national parks, our teachers and learners never seem to get tired of connecting to distant places. One of the most recent connections was with a young author in another state! 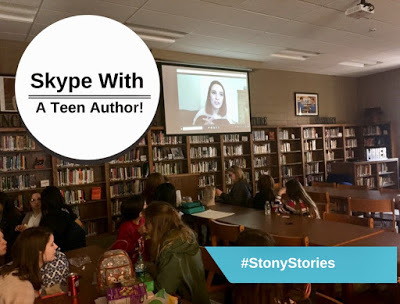 I remember running across teen author, Ashley Royer (@RTFbook), on an Internet search last year as we were looking for potential connections for our students. After reading about her, I discovered she had accumulated lots of fans on Wattpad and later became a published author. Her book, Remember to Forget, has been in publication since 2016. I decided to connect with Ashley via Twitter during the spring of 2017 to get more information about her book. She actually signed the copies we purchased. Since the end of the school year was quickly approaching, we were never able to connect her with our students. This school year, we discovered several students that are interested in writing. I shared Remember to Forget with some of these students and told them I had communicated with the author last year. They indicated they would like to speak with Ashley, so I reached out on Twitter to see if she might Skype with us during lunch. It turned out Ashley was on spring break from college, and she agreed to connect during lunch. The students were so excited that they were going to get to visit with a teen author! I used a collaborative document to have the students submit questions for our connection. Below are the questions we all created together. 1. How old were you when you developed a passion for writing? 2. How do you get an idea for a book? 3. How did you develop your writing style? 4. What was your experience with Wattpad? 5. What are the biggest challenges for young authors to get published? 6. What advice would you give young authors? 7. How old were you when you began to write Remember to Forget? 9. How many hours a day do you write? 10. Do you have any people that help you with editing or coming up with ideas within your stories? 11. If you could meet any author in the world, who would it be? 12. What author did you idolize/look up to as a child? 13. Where do you get your inspiration for writing books? 14. What was the hardest scene to write for you? 15. How long on average does it take you to write your books? 16. 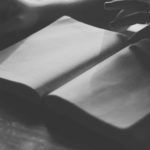 Do you believe in writer’s block? Our students were very excited to get to the library on the day of the connection. We invited students that had submitted questions to come to the Microsoft Surface to be on webcam as they visited with Ashley. During the session, Ashley told about herself and her love of writing. It was very inspiring to our learners. Afterward, they wanted to know when we could Skype with an author again. They began listing names of authors they wanted to contact. It was a great day! 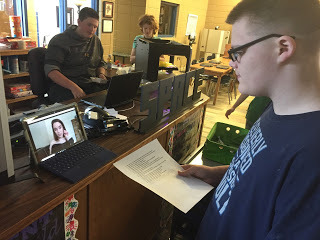 This activity was an excellent reminder to me that Skype in the Classroom has many resources for connecting. Previously, I wrote a blog article about some of these tools. In the future, I need to look on their site for additional author connection possibilities. I encourage you to look for authors that are willing to connect via webcam. These types of experiences may help inspire your learning community. Who knows… it may inspire a future author!